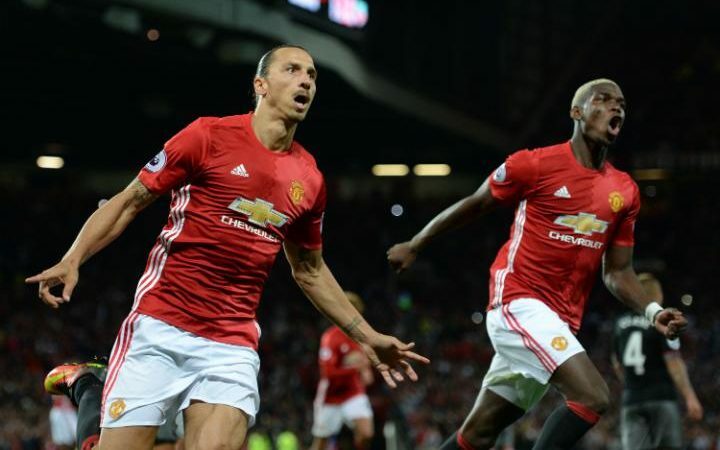 Paul Pogba made a impressive debut for Manchester United but Zlatan Ibrahimovic scored a double to continue his scoring streak. Zlatan scored his debue goal in Previous encounter against Bournemouth by scoring last goal from the Manchester United side and confirm the victory. Eric Cantona said the Swede would never taken his title as Old Traffordâ€™s â€˜kingâ€™ to which Ibrahimovic responded by saying with typical modesty he would instead become a â€˜godâ€™. Two of his goals have been towering headers from crosses, something United fans havenâ€™t witnessed for a number of years. Ibrahimovic had a chance to complete his hat-trick from a Valencia cross but got underneath the header. It looks like Manchester United invested their money at good place as we have seen the start of the season. They will be tested when they face to some quality clubs like Chelsea, The foxes, Arc rival Man City, The Gunners and some others in later part of the season. Zlatan Ibrahimovic complete change the focus from Pogba to him after this match cause everyone is talking about on Pogba before match now it only Zlatan after his performance in first two matches. He became talk of theÂ Old Trafford and proved his presence at the club and in the Premier league. Still we haven't seen any controversy or fight of him. It's very big tournament we wish we see some from him as he likes to do.